This painting shows a prince at a dovecot feeding the birds. 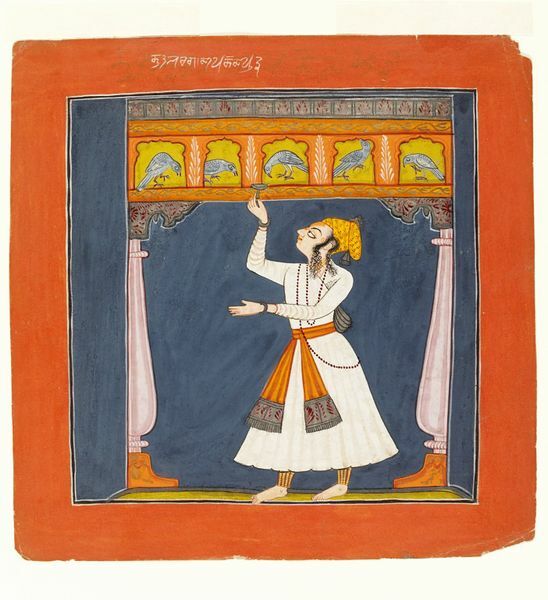 It comes from a ragamala or 'garland of ragas', a series of pictorial depictions of the various musical modes. An inscription in Takri, the script used in the Punjab Hills of northern India, identifies the mode illustrated here as kuntala raga, 'son' of dipakeda raga. 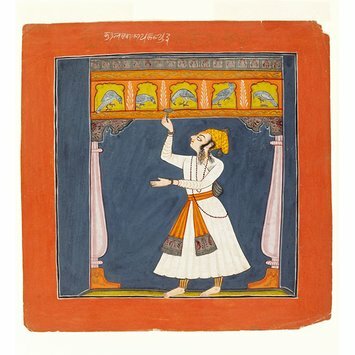 A ragamala painting in opaque watercolour on paper, illustration to the musical mode kuntala raga, a prince at a dove-cote feeding birds. From the collection of Mr. Michael Rothenstein; IS.46 to 73-1953 were purchased for £300. p. 40, cat. no. 33. Archer (1973) attributes paintings of this series to Kulu. Goswamy and Fischer (1992) attribute them to painter(s) active at Bahu.